To improve the indoor air quality of our new home, we have adopted several strategies, which will be described below. All interior paints were "low VOC" (volatile organic compounds). Not only will this reduce the concentration of these compounds when we move in, but it avoided the stench of "new paint" for the workers. Our carpeting (Mohawk SmartStrand) features the "IAQ Green Label Plus" designation from the Carpet and Rug Institute. Green Label Plus is designed for architects, builders, specifiers and facility managers who want assurances that carpet and adhesive products meet the most stringent criteria for low chemical emissions. Common sources of formaldehyde, a known carcinogen, are reduced: insulation is formaldehyde free and particle board in cabinetry is sealed to keep formaldehyde from off-gassing. In old, drafty houses, the plenty of ventilation comes through cracks in the building envelope, resulting in energy loss. Newer "tight" construction eliminates these unwanted drafts to save energy, but at the expense of having stale air. Ultra-tight construction, with techniques such as spray foam and advanced sealing (as we have done) decreases the natural air turnover even more. To keep the air fresh while reducing the energy loss, we have installed a Heat Recovery Ventilator. This system exhausts air from the inside to the outside, and draws in fresh air from the outside. When doing this, the streams of air pass by each other in the "core." They do not mix, but heat is transferred from the warmer air to the cooler air. This results in the recapture of around 40-50% of the energy that was used to heat or cool the air. Our HRV also contains a HEPA filter. 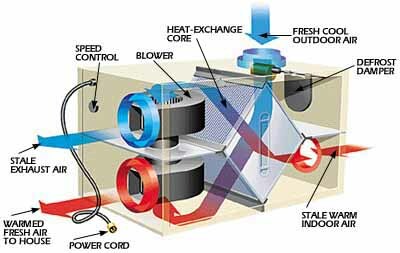 As air is filtered through the system -- either exchanged with the outside or recirculated in the unit -- it passes through a filter that removes dust and allergens. Radon is a radioactive gas that’s invisible and can neither be smelled nor tasted. It is produced from a natural breakdown of uranium in soil, water and rock and can contaminate the air we breathe. According to a recent National Academy of Sciences study, radon is the second leading cause of lung cancer in the U.S. today behind smoking. As it turned out, Focus on Energy offers a $250 rebate for an "active sub-slab and moisture management and ventilation system" -- and the cost to us to add a fan was about $200. Thus, the option to add the fan was cash-flow positive, so we got the complete solution up front.